Web Design consulting business servicing GSA, e Seaport contracts. Website Design for eSeaport GSA Consultants Businesses | USI located on the Virginia Peninsula contracted VISIONEFX to design a straight forward no nonsense corporate website design that representing all the business units and company expertise. 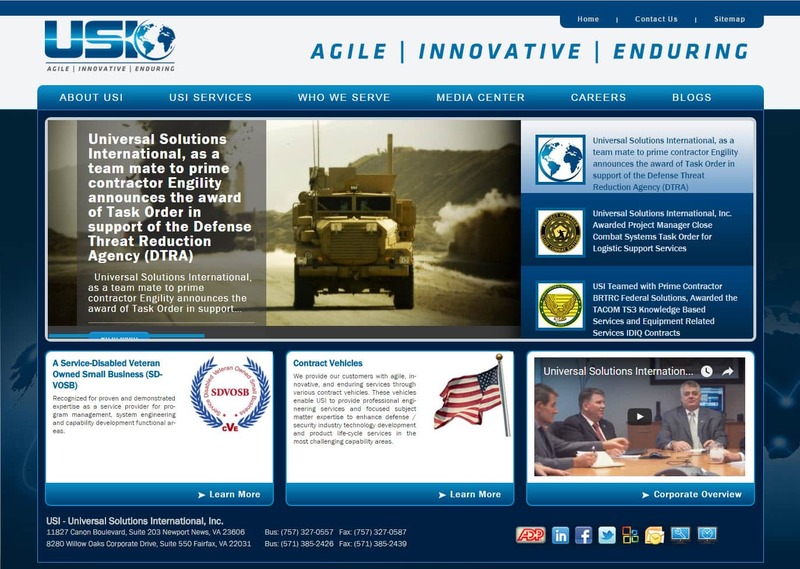 The team at USI was so pleased with their website redesign, they also hired us to redesign the US Army Mantech website. When searching Website Design Newport News Virginia look no further than the web design experts at VISIONEFX. VISIONEFX has an extensive portfolio of website design GSA consultants, GSA contract holders websites. VISIONEFX develops and designs websites for business and provides web design in Virginia and the USA. Professional business consultants coast to coast choose VISIONEFX. Our services include; custom websites, eCommerce and web applications. We also provide website repair and maintenance plans to keep your website up and running smoothly. Call VISONEFX at (757) 619-6456 or email direct to info@visionefx.net.